Nancy’s been seeing things lately, poor dear. Well we all see him Nancy Especially if we’ve got Turner Classic Movies. Just adore him in Dark Victory as Bette Davis’ ultra soigne and gallant gay pal. True. And Barry has been quite Reganesque lately. Though not the Ronnie of Dark Victory. Very Presidential, no? Bu I suppose we should give him time for tenderness. After all, there’s THIS. “Saturday, June 28th I’d just gotten back from vacation and New York seemed broiling hot. Ken and I decided to go to the Village for dinner that night – probably to the Five Oaks, a small and popular downstairs place that got a mixture of straights and gays. We came out of the IRT station at Sheridan Square somewhere between nine and ten p.m. On the other side of Seventh Avenue, just a ways down Christopher Street, we saw a crowd that was big enough to be spilling off the sidewalk and into the street. At first we were going to go over to check it out, but then realized that we were almost late for our reservations already and would probably end up standing in line if we took the time, so we went on. When we left we’d forgotten about the crowd, and we walked further west, anyway, rather than back to the square. Nothing seemed unusual for a Saturday night. 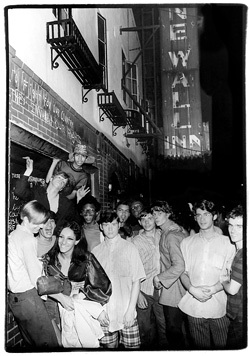 What we had seen, of course, was the beginning of the second night of the Stonewall riots. Wednesday night I stopped in the Candlelight, and someone asked me if I had heard about what happened in the Village. I hadn’t and he told me that gay guys had been rioting with the cops. The next day I went through a stack of newspapers in the trash closet in the hall. I found a copy of the Times that had a small article – on a far inside page, as I recall. It was an article in that very morning’s paper, which covered the final disturbance which was taking place as I was first hearing about Stonewall the night before. “LGBT Americans have made, and continue to make, great and lasting contributions that continue to strengthen the fabric of American society. There are many well-respected LGBT leaders in all professional fields, including the arts and business communities. LGBT Americans also mobilized the Nation to respond to the domestic HIV/AIDS epidemic and have played a vital role in broadening this country’s response to the HIV pandemic. ” These individuals embody the best qualities we seek in public servants, and across my Administration — in both the White House and the Federal agencies — openly LGBT employees are doing their jobs with distinction and professionalism. — which of course you aren’t. In fact there’s not a dime’s bit of difference between you and Darth Cheney, who has been muttering into microphones about this lately. “outlawing discrimination in the workplace, ensuring adoption rights, and ending the existing “Don’t Ask, Don’t Tell” policy in a way that strengthens our Armed Forces and our national security. By replacing it with a”New Improved Don’t Ask Don’t Tell” of course. Oh and we can easily guess who you’ll put in charge of that. “These issues affect not only the LGBT community, but also our entire Nation. As long as the promise of equality for all remains unfulfilled, all Americans are affected. If we can work together to advance the principles upon which our Nation was founded, every American will benefit. During LGBT Pride Month, I call upon the LGBT community, the Congress, and the American people to work together to promote equal rights for all, regardless of sexual orientation or gender identity. Well that’s enough dancing from you, Barry. Let’s have an encore from the boys.